Scottsdale, Arizona (PRWEB) October 10, 2008 -- The media, Hollywood and our government have done a stellar job of convincing people that God has essentially died and that rules aren't important. The Ten Commandments are now merely Ten Suggestions at best. With little respect for society and each other, our world has changed dramatically. Children are killed, unjust wars are fought, self-serving greed is common and racial hatred still exists. Even the acknowledgment of God is not only banned in schools and public venues in America, it is now politically incorrect to refer to God in any context in public discourse. It seems at times that God is referred to only by those who use His name for personal gain. Pamela Young's new novel, "Be Still," addresses all of this and goes further to say that not only is God watching us, but there are consequences for our actions. "Be Still" opens with the emotional election of a new Pope, and a warning from God. Some unlikely messengers in different parts of the world claim to have been visited by angels. Emmy-winning television reporter Amanda Fox first hears about the story and, skeptical as she is, immediately dismisses it. But as angel sightings continue to come to her attention, she is intrigued. Despite a warning from her producer and the president of the news network, she pursues the story and interviews people from around the world who claim to have seen these angels. The chilling evidence shakes her beliefs. Those who have spoken to the angels repeat the same ominous message from God, "Prepare yourselves, for the time is at hand." Young writes: "Your Holiness," Amanda ventured as she looked into his eyes, "are these the end times? Is this the end of the world?" He was quiet for a moment and then said, "Only God can answer that question, Ms. Fox. My personal feeling," he continued slowly, "is that mankind is increasingly causing God much sorrow. We're living in a very difficult world right now due in no small measure to our selfishness. Children disrespect authority. Nations and religions disrespect each other and that leads to war and suffering and killing. Not unlike Sodom and Gomorrah, what God has created, He can also destroy." "Be Still" is based in Washington DC. In pursuit of the truth, the action moves quickly from Rome, to Lima; New Orleans; Los Angeles; Hawaii; the Arizona desert; Boca Raton; New York City; Tehran; Victoria, BC; and the plains of Africa. Pamela Young lives with her husband in Scottsdale, AZ, and Portland, OR. 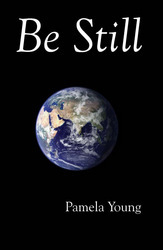 "Be Still" by Pamela Young is available at Amazon.com and BarnesandNoble.com.